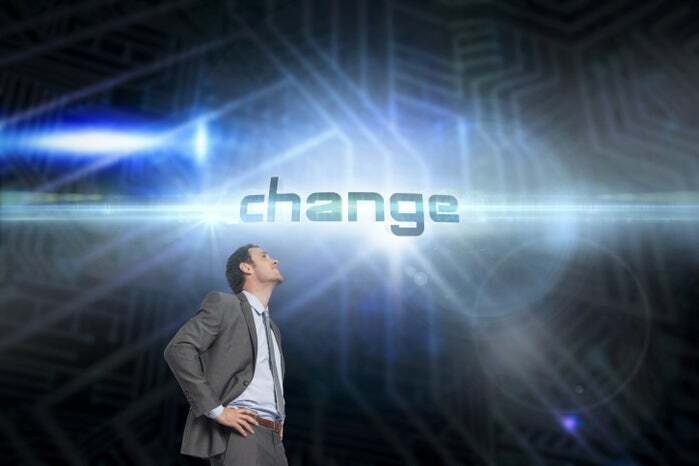 Digital transformation will change the way consumers and suppliers relate and behave. The range of offerings will become more complex. More than ever, IT executives must be aligned with business and use today’s digital technologies wisely to help companies finesse the trade-offs between complexity’s costs and benefits. The Digital Age, brought by the rise of cyber physical systems (CPS) and the Fourth Industrial Revolution, have completely changed the way companies supply their products to the market and the way consumers behave while buying them. The combination of hyperscale on the supply side and the need of hyper customization on the demand side have created an amount of opportunities like never seen before. A good example of that is how Amazon.com operates. Let’s consider that a few years ago it would be impossible to imagine a retailer that offers millions of products and hundreds of variations for each, yet keeps it simple for customers to make a choice. Today, the company is able to create value from its product complexity with a simple set of customer-facing processes, such as search, ratings, reviews and suggestion. Unfortunately, the brand new economy of complexity isn’t as simple to the entire market as it is for Amazon.com. Managing business complexity has usually involved a trade-off that forces companies to choose between the value that comes with its complexity and the efficiency benefits of simplicity. As the digital age has overcome boundaries and businesses where able to entered new geographies, new products and channels where developed and traditional products and services where unbundled, creating new granular customer segments, companies’ offerings became more complex for adding value to the market. As an inevitable consequence, companies made it more difficult for customers to interact with them, they made it harder for employees to perform their work and, finally, they added more complexity to their costs. The good news is that counting on today’s increased digital technologies, companies can increase value-adding complexity in their product offerings while keeping processes for customers and employees simple, which will certainly balance costs. Pre-Industrial Age –Individual Production: before there were machines working within factories and lines of production, the only sources of energy and means of production for companies were man and animal power, meaning that the volume of production depended on the physical state of the men and animals that were producing. At this stage there was no scale efficiency whatsoever, production was very limited and there wasn’t any means of an accurate cost forecast or control. 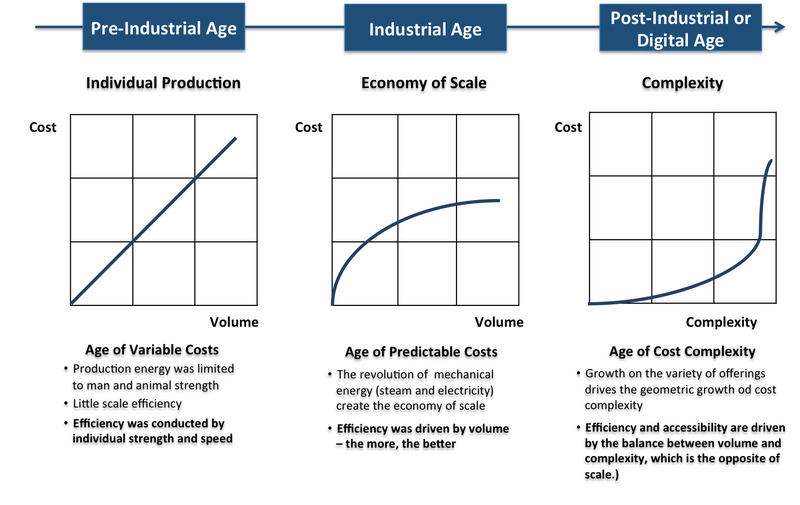 Industrial Age – Economy of Scale: this is where the mechanical and energy revolution starts with electricity, steam, oil and other fuel-powered machines appear within factories and created production lines. At this point, there was a better forecast of costs, for people new what a machine was capable of producing and, the machines, higher were the volumes. This is where the economy of scale appeared and efficiency was driven by the volume produced, meaning that the more produced, the better. Post-Industrial or Digital Age: this age was marked by the rise of the cyber physical systems and was marked by a series of changes in the demand and supply relationship, creating a great increase on the variety of products and services offered by many companies to the market in attempt to cover all latent needs and new customer segments created by the unbundling of several products and services. That combined with the hyper customization that is being demanded by customers is the perfect formula for the rise of an unseen cost complexity or economy of complexity. At this point, the balance between volume and the cost complexity itself drives efficiency, which is the opposite of scale. 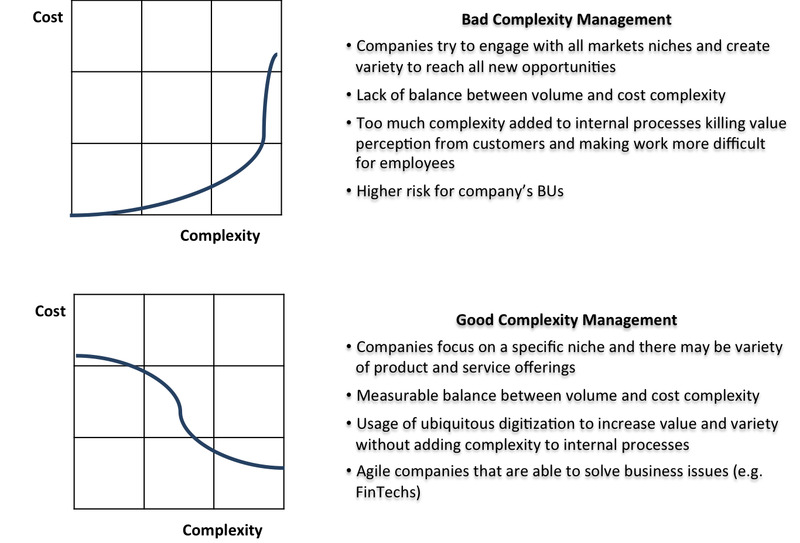 The critical part of the economy of complexity is that is can be good or bad, depending on how companies will manage the “dose” of complexity to add value. It’s common for companies trying to add value by increasing variety in their product and service offerings almost inevitably add value-destroying complexity in their processes and, on the customer side, increased product variety can make the choosing process much more difficult for customers. Moreover, this complexity also reaches internal process, which often grows with increased product complexity. While confused customers can severely damage revenues, difficult or confused internal processes increase company costs. A mismanaged complex process overwhelms customers and employees, making them contact multiple people, enter data multiple times, log into different systems or contact different call centers for different products from the same company, and these companies are often perceived as difficult to deal with by costumers, who may spread the word on different social media channels. Finally, the most important question is who should lead the company to its complexity balance? Managing the economy of complexity and the new way business are being conducted due to this complexity, it has become a cross-company issue, and no individual business unit leader can typically be fully in charge of finding this balance. Looking at the c-level leadership and their responsibilities, the CFO would be a natural fit if complexity management was mostly about cost management, or the COO hold the knowledge of the internal processes needs, the CMO (or the head of innovation) is focus on products and services, as well as gathering market information. As for the CIO, this executive is especially attuned to a company’s complexity as it is layered into IT systems year after year. CIOs are also at the heart of digital transformation, which helps to rethink complexity management in a very strategic way. The economy of complexity demands an executive committee and collaboration is the key to find the ideal balance for each company. Whoever is leading a company’s search for the complexity balance needs to lead a cultural change to embed complexity management into the company’s DNA after first creating the vision and the simple set of metrics. At the end of this journey, there are almost always quick wins and the rewards can be very substantial.